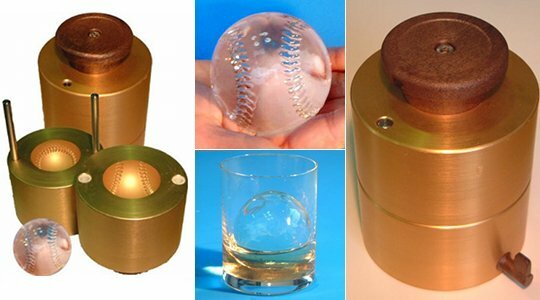 If soccer is not your thing but you still love your sports, turn to the Ice Ball Baseball Mold. It makes perfect sports-themed ice spheres in seconds that not only look superb, they also keep your drink cool for longer. Just like the regular ice sphere mold or the football model, the Baseball Mold is easy for both pros and ordinary people at home to use. Just heat up your ice and aluminum mold, pop on the ice and you will be "playing ball" in seconds. The mold is available in a large 65mm version so may take a few moments more than smaller models, but you can still create around 30 an hour if you have your ice ready. We think you'll agree, the baseball looks very detailed and realistic...you might even be tempted to pitch them and see them fly! Ideal for home drinkers who take their beverages seriously it also will prove very attractive, practical and a great talking point in any bar or restaurant.